Wow, look at this 2191 square foot house in family friendly Byron in south west London, one of the most sought after neighbourhoods. This 3 bedroom house is in one of the best locations in Byron because it is a short walk to Byron Somerset Public School or St.George Catholic School. There are 2 1/2 bathrooms, a master ensuite, separate dining room & living room, a family room with a fireplace and a spacious eat in kitchen. Finished basement with oodles of storage , a 27’5″ x 12′ rec room and a double car garage to boot. Fenced back yard with patio and sprinkler system. Note: All the windows except patio door and basement have been replaced over the last 4 years. This house is much larger than it looks, it has a great price and with your finishing touches, a great place to call home! This 3 bedroom house is in one of the best locations in London, beautiful Byron and a short walk to Byron Somerset Public School. 2 1/2 bathrooms, master ensuite, separate dining room & living room, a family room with a fireplace and a spacious eat in kitchen. Homes like this one very seldom come on the market, make your appointment today while it is still for sale! Byron houses & condos were highly sough after in 2017 with 232 single family houses selling for a median 101.43% of the asking price and these took abou 8 days to sell! Condos in Byron, from apartment condos to detached one floor townhomes were extremely sought after with 73 selling through our MLS system for 100.59% of the asking price and taking about 15 days to sell! I have prepared an analysis of this activity, with sales prices, days on the market and the asking price which you can receive by going here. Byron in South West London is bordered by Wickerson Rd to the west, Southdale Road to the south, Commissioners Road to the north and Colonel Talbot Road to the east. Byron has been consistently been a sought after London neighbourhood to live in with Springbank Park (300 acres along a stretch of the Thames River and has 19 miles of trails.) and the Thames River, Boler Mountain (a ski and mountain bike area known to the locals as “the bump“), churches, schools, a library, a fire hall, a legion, a Masonic hall , bistros and dining, professional offices, medical, drugstores, LCBO, jewelers, drycleaners and more. 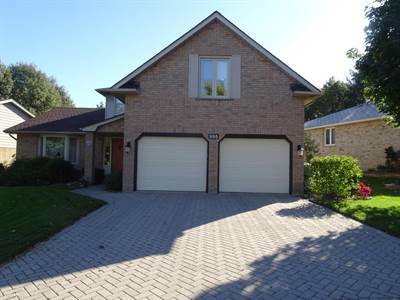 Nearby are 8 public and private golf courses and walking & biking trails galore, beautiful Komoka Provincial Park with its many trails along with Warbler Woods Trail. The Optimist Club of Byron is an example of community volunteers giving back to the community with activities through out the year. h 231 houses were sold for 99.6% of asking price and these took about 14 days to sell! 79 condos in Byron changed hands through MLS in 2016, averaging 33 days on the market and selling for about 99.2% of the asking price. There is a good selection of condo properties in Byron as well, starting from $175,000 for a townhouse up to $600,000 plus for a detached one floor townhome and a few high rise apartment condos with the new Tricar building in 2018 across from Springbank Park. 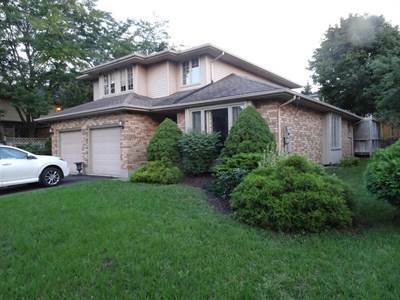 One of the most desirable neighbourhoods in London Ontario! This 3 bedroom, 2 1/2 bathroom house has a fenced backyard and a double car attached garage. From the enclosed foyer you will notice a desirable flow through out the house. The large living room has a window seat, the large bright dining room is a treat as well. On the main is a large family room with a gas fireplace and a nice den/office. Laundry is on the main floor too. The kitchen has new counter tops, a new stainless built in microwave, dishwasher, stove and fridge, all purchased in 2017. .Kitchen and family room windows 2012.Centennial Windows and Doors lifetime warranty that can be transferred to new owners. Whew! Do you not think you may want to have a look at this house before it gets snapped up? From January 1, 2017 to July 10, 2017, the Byron neighbourhood in London Ontario saw 145 houses change hands for an average price of $472,000 which was 105% of the asking price and these took about 14 days to sell! For condos in Byron, 50 were sold through MLS in London for an average $298,119 which was 104% of the asking price and these took about 32 days to sell. As you can see,the real estate market has set records for 6 consecutive months and July may be no exception. Will this continue? In this blog, I share with you the overall London real estate market, comparisons among other cities and my take on what I feel the market will do. Byron has been consistently been a sought after London neighbourhood to live in and 2016 was no different with Springbank Park (300 acres along a stretch of the Thames River and has 19 miles of trails.) and the Thames River, Boler Mountain (a ski and mountain bike area known to the locals as “the bump“), churches, schools, a library, a fire hall, a legion, a Masonic hall , bistros and dining, professional offices, medical, drugstores, LCBO, jewelers, drycleaners and more. 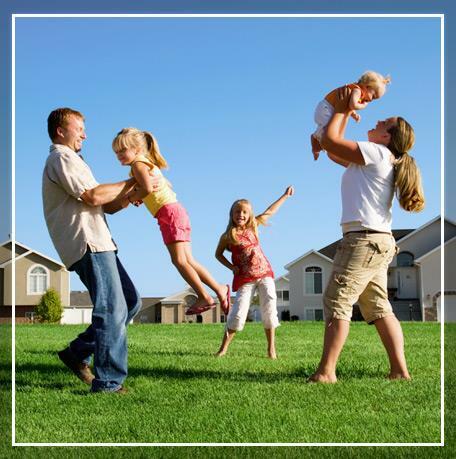 Nearby are public and private golf courses and walking & biking trails galore. 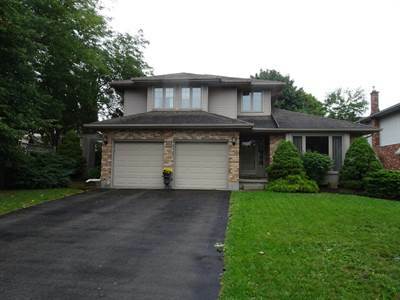 Byron London Ontario houses for sale in 2016 were in demand and highly sought after as 231 were sold for close to full asking price or more! For the many followers of my real estate market price index, I stopped publishing an average house price in Byron because in this case, averages were not a true indicator of an average as we saw houses sell in Byron from as low as $227,500 and as high as $1,300,000! There is a good selection of condo properties in Byron, starting from $175,000 for a townhouse up to $600,000 plus for a detached one floor townhome and a few high rise apartment condos with a proposed new Tricar building in 2017 across from Springbank Park. 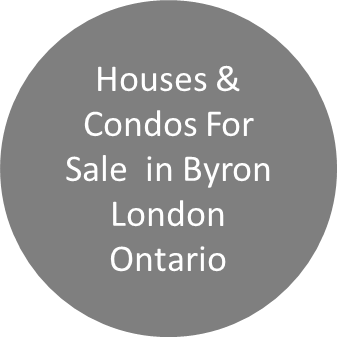 Byron London Ontario House & Condo Market Hot! Have you been thinking of moving to Byron, a family neigbourhood in south London that offers a lifestyle away from the hustle and bustle, yet minutes to downtown London? A London neighbourhood that has Springbank Park and the Thames River, Boler Mountain (a ski and mountain bike area known to the locals as “the bump”), every kind of church you can think of,(if not church, a few restaurant bars ), a library, a fire hall, a legion, a Masonic hall and more. Some great shopping, bistros and dining, professional offices, medical, drugstores, an LCBO (known to the locals as the “personality changer”), jewelers, drycleaners and more. Easy access to the 401, 403, Lake Huron or Lake Erie, some great public and private golf courses, health clubs, walking trails, fishing and more. From January 1, 2016 to August 18, 2016, 167 houses sold in the Byron neighbourhood for an average $386,753 which was 99.7% of the asking price. However, 26 houses did not sell in Byron and are either off the market or were re-listed. 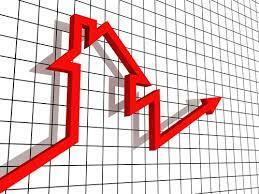 Again, price and condition dictates if a home sells and how it is marketed. 55 condos have sold averaging $258,819 and these condos in Byron sold for 99.2% of the asking price and took about 31 days to sell. In this same period, unfortunately, 15 condos did not sell. There are 16 condos available for sale as of August 18 and 6 of them have been on the market over 60 days! 215 houses in Byron in London Ontario changed hands for an average price of $362,712 which was 98% of the asking price and were on the market for only 29 days! In the same period, 85 condos in Byron sold for an average price of $251,333 and these sold for 98% of the asking price and took about 45 days to sell. 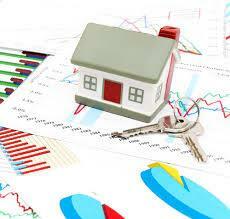 218 houses changed hands for 98% of the average asking price of $368,238 and took on average 32 days to sell. Condos in Byron did well with 48 being sold for 99% of the average asking price of $220,596 and those that did sell, sold in 38 days! There are two secondary schools serving the needs of Byron students. The closest is St. Thomas Aquinas Catholic Secondary School in the London District Catholic School Board, across the Thames River. Students of any religious denomination may attend. Most secondary school age students in Byron attend Saunders Secondary School in the Thames Valley District School Board in the Westmount suburb of London. Though they do not live within the drawing area, a number of secondary school age children from Byron currently attend Oakridge Secondary School, located in the Oakridge suburb of London. 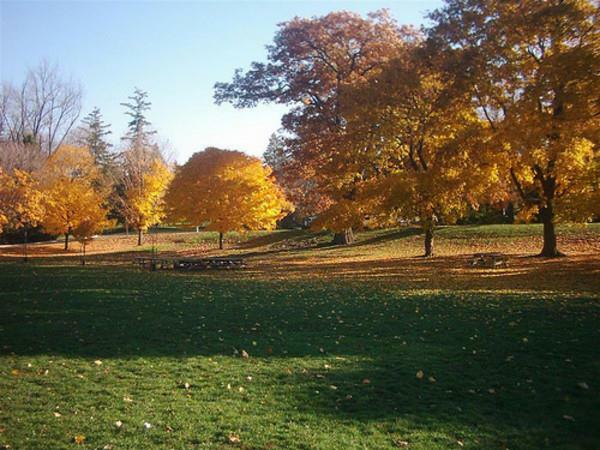 Springbank Park is 300 acres along a stretch of the Thames River and has 19 miles of trails.